7th-12th grade study guide, Book-club discussion questions and a web-based research guide. The questions in this guide are appropriate for family read-aloud time with younger children, or 7th to 12th grade classroom/homeschool assignments. Topic areas such as History, Geography, Art, Social, Politics, Ethics, Cultural, and Research are addressed. Includes short and long-term research project ideas. My hope is that this novel will open to the reader the time period of the early church and that by their investigation, they will be better and more faithful individuals. note: due to some serious ethical and situational themes in the book, this book needs parental guidance for children 12 or younger. Most appropriate for adults, these questions help you apply the allegorical world of Trunk of Scrolls to your own life at work, at church, at home. Knowledge is addictive, and primary source history surfing is the next-best thing to time-travel. For more information on some of the critical elements from TRUNK OF SCROLLS, take a look at the following pages with their links. Enjoy the trip! 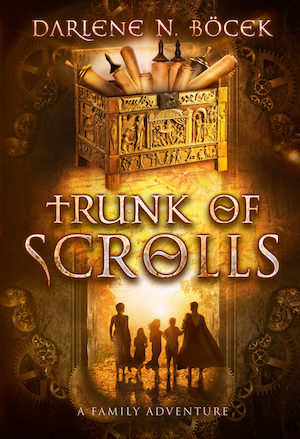 The TRUNK OF SCROLLS weaves historical fact with Christian truths and the misadventures of endearing characters: a Tolkienesque journey tale where the trolls and dragons are those we really meet in American Christian life. a free serial-novel introducing Trunk of Scrolls.